McGill is playing host to a series of lectures in Crystallography, marking the International Year of Crystallography and the International Congress of Crystallographers in Montreal until next Tuesday. 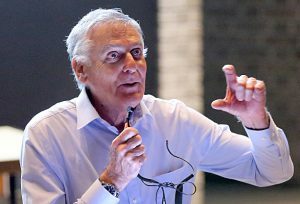 Dan Shechtman, who spoke Thursday night, was awarded the 2011 Nobel Prize in Chemistry for a controversial discovery – but only after his research was initially castigated by such luminaries as fellow Nobel winner Linus Pauling, among others. Prof. Dan Shechtman, who won the 2011 Nobel Prize in Chemistry, speaks at McGill Thursday night as part of a lecture series marking the International Year of Crystallography. Photo by Owen Egan. McGill is playing host to a series of lectures in Crystallography, marking the International Year of Crystallography and the International Congress of Crystallographers here in Montreal until next Tuesday. The next lecture in the series is Monday, Aug. 11, in Leacock Room 132, from 8:15 to 9:30 p.m. In this lecture, Prof. Ron Lifshitz, School of Physics and Astronomy at Tel Aviv University and of Condensed Matter Physics, at the California Institute of Technology, will discuss the advances in Crystallography that sprang from the controversial 1982 discovery of quasicrystals by Dan Shechtman, who was later to receive the Nobel Prize in Chemistry, but who was initially shunned and even attacked by his colleagues when he first proposed it. Lifshitz will review the scientific revolution that sprang from Shechtman’s discovery and discuss the many effects it had on science and beyond. Shechtman himself delivered the second of the lecture series Thursday night, outlining the story of the discovery of quasi-periodic crystals and describing the important role electron microscopy has played as an enabling discovery tool. Shechtman, the Philip Tobias Professor of Materials Science at Technion University in Israel, was awarded the 2011 Nobel Prize in Chemistry, but only after his research was initially castigated by such luminaries as fellow Nobel winner Linus Pauling, among others. Crystallography is the study of the arrangement of atoms in solid matter. It is McGill Principal Suzanne Fortier’s academic discipline.